Stay in the heart of Waikiki and enjoy incredible live entertainment at the Waikiki Beachcomber by Outrigger. Located on Waikiki’s main street, Kalakaua Ave, the resort is just 300 steps away from Waikiki Beach and right next door to the world-class International Marketplace shopping centre! Each of the 496 signature guestrooms are spacious and comfortable and include a range of incredible facilities to enhance your stay. From plush bedding, to designer toiletries, MP3 docks and private, furnished balconies, you’ll feel relaxed and revived during your stay here. 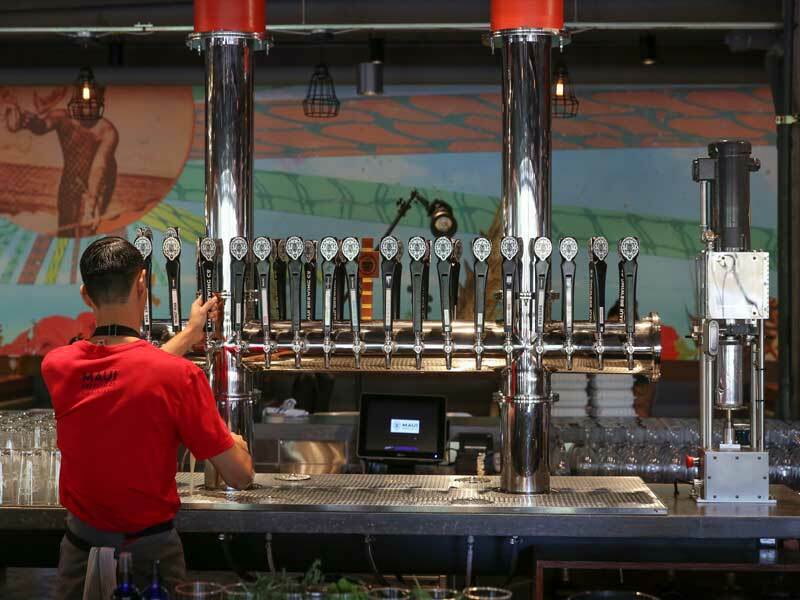 Enjoy Hawaii-grown Kona coffee at the café in the lobby, meals and happy hour at the Maui Brewing Co. Waikiki restaurant and live entertainment nightly at the Magic of Polynesia show on site! Be entertained at the Waikiki Beachcomber by Outrigger! Set in the heart of Waikiki, this impressive resort boasts stunning features and facilities, including nightly shows and live music! 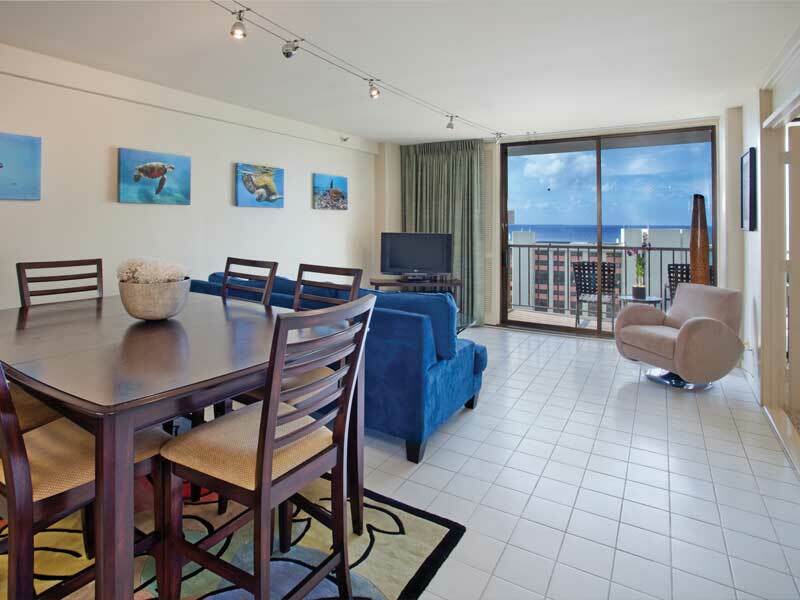 Waikiki Beachcomber by Outrigger is located in a premier position on Kalakaua Avenue (Waikiki’s main street). 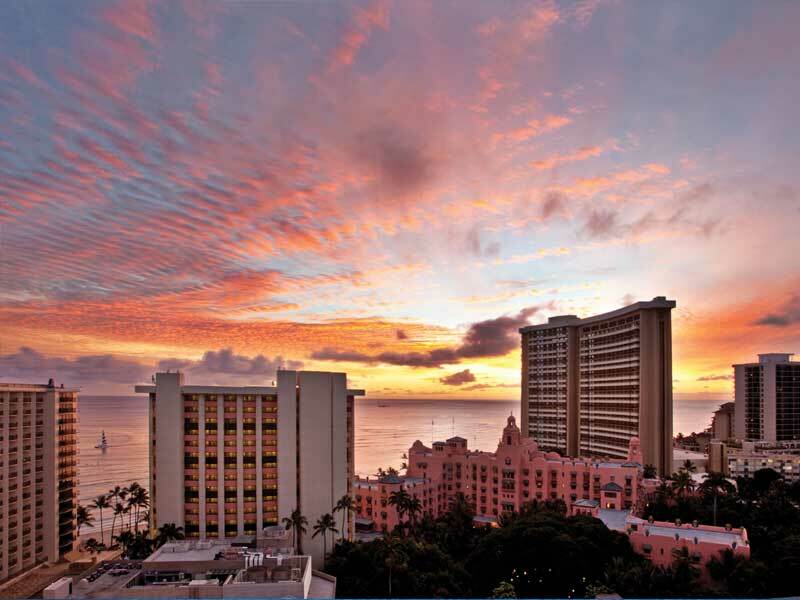 The resort is just 300 steps away from Waikiki Beach and next to the world-class International Marketplace. Guests can enjoy comfort, convenience and so much more—there is something here to suit a broad range of travellers! 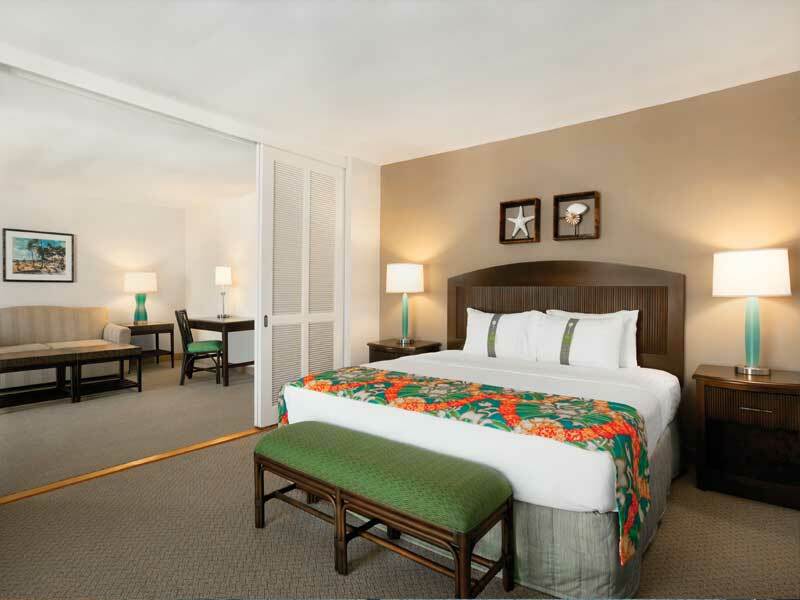 Each of the 496 guest rooms at the Waikiki Beachcomber by Outrigger are well-equipped and spacious. They can accommodate both large and small groups plus, with the resort’s smoke-free policy, all guests can enjoy fresh coastal breezes off their own private balconies! Complimentary Wi-Fi and will keep guests connected to home. There are compact refrigerators in all rooms and laundry facilities are available. The tour desk can assist in organising a range of engaging activities around Honolulu and beyond plus there is an express checkout service available to eliminate the stress from your holiday! Why Go To Waikiki Beachcomber by Outrigger? Waikiki Beachcomber by Outrigger is an entertainment frontrunner in Waikiki. 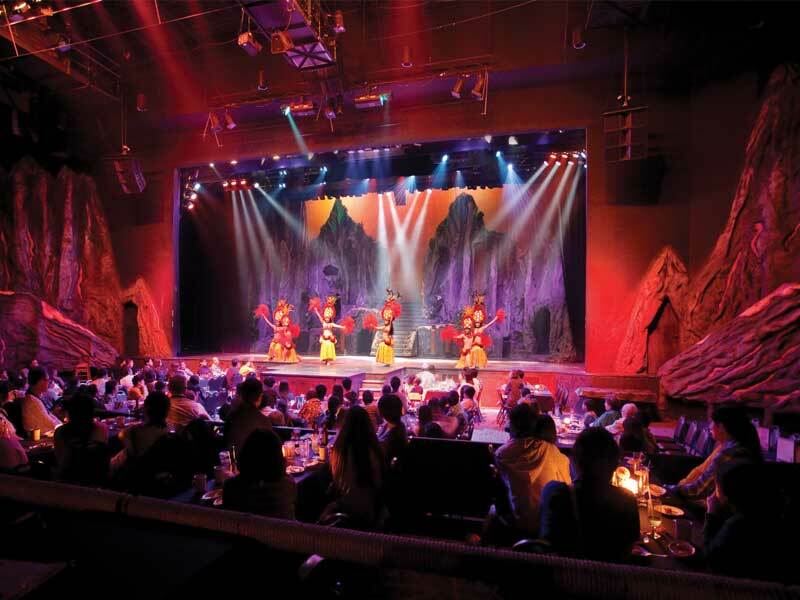 Not only is it located close to the vibrant nightlife scene of the city, guests can enjoy incredible displays of culture, art and music at the nightly theatre spectacular on site! The Magic of Polynesia show includes illusions, dramatic special effects and professionally choreographed Polynesian entertainment. During the day, the entertainment continues. Soak up the sun in the freshwater outdoor pool, sweat it out in the fitness centre, indulge in relaxing services at the Spa La Cure or browse either the gift shop or Macy’s Department Store on the ground floor! There are two dining options available at the Waikiki Beachcomber by Outrigger. 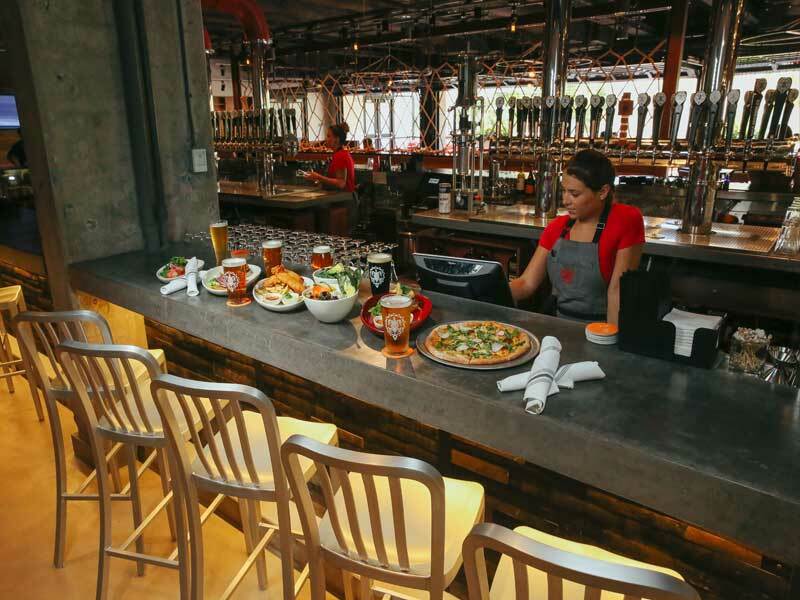 Enjoy craft beverages and fresh local ingredients at the vibrant Maui Brewing Co. Waikiki. The restaurant is open 7am to 11pm daily and boasts live music performance and happy hours (including a late night happy hour special!). The Hawaiian Aroma Caffe, also located in the lobby, specialises in Hawaii-grown Kona coffee and light meals with an Italian twist. The café is gloriously light-filled and is open from 6am to 8pm daily. Grab a panini to take with you to the beach or to fuel a long day shopping in the world-class International Marketplace next door! Check-in to your new home-away-from-home knowing that your every need will be met. Partial Ocean View (King) rooms boast 30sq. metres of space, a balcony that looks toward Waikiki beach and a plush King bed. There’s plenty of storage throughout the room, making it ideal for those who want to unpack and make themselves comfortable, plus it also features a 32” flat screen TV, air-conditioning, a coffee maker, mini fridge, MP3 clock radio, Wi-Fi and more! These rooms can accommodate up to 2 guests. Wake up daily to views of the stunning Waikiki Beach and take in the fresh ocean breeze on our private balcony! Set facing the oceans, these rooms are light-filled and airy. They offer 30sq. metres of space, boast a plush King bed, 32” flat screen TV, air-conditioning, coffee maker, mini fridge, MP3 clock radio, Wi-Fi and more! Unpack and make yourself at home—these rooms feature plenty of storage for your belongings and the rooms are set up well for those who need extra space to get around. Refresh yourself, ready for each day, in your separate en-suite bathroom. These rooms can accommodate up to 2 guests. Travelling with the family and looking to treat them to an outstanding view? 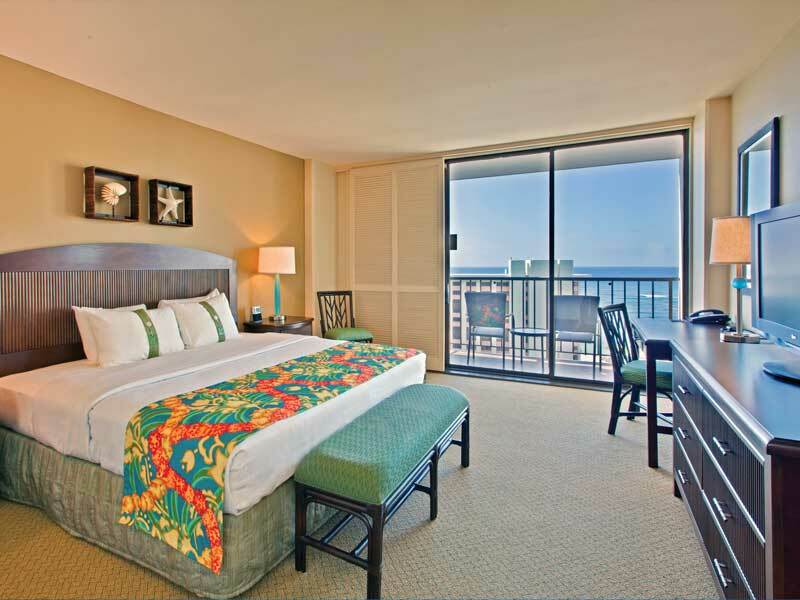 Ocean View (Double) rooms provide stunning views of the Pacific and Waikiki Beach and can sleep up to 4 guests. With 2 double beds, 30sq. metres of space, a private balcony and more, these light-filled rooms will make you feel right at home! Other features include a 32” flat screen TV, air-conditioning, business desk, coffee maker, mini fridge, MP3 clock radio and Wi-Fi. They also include a separate en-suite bathroom so you can prepare for each day in privacy! It doesn’t get much more iconic than this! Not only do Deluxe Ocean View (King) rooms look out across the Pacific Ocean, they provide exceptional views of key Waikiki sites, like Waikiki Beach and the Diamond Head crater! Sink into plush bedding, watch your 32” flat screen TV, access Wi-Fi and more. Features include a separate en-suite bathroom, air-conditioning, a coffee maker, mini fridge, MP3 clock radio and a private balcony. Deluxe Ocean View (King) rooms offer 30sq. metres of space and accommodate 2 guests. Take the whole crew and holiday in style! Deluxe Ocean View (Double) rooms accommodate up to 4 guests and offer 30sq. metres of space. Complete with 2 double beds, a private balcony that faces the ocean and beach, Wi-Fi, a 32” flat screen TV, coffee maker, mini fridge, MP3 clock radio and so much more. Start and end each day refreshed in your private en-suite bathroom and bask in the tasteful tropical artwork throughout the space as the natural light streams in! 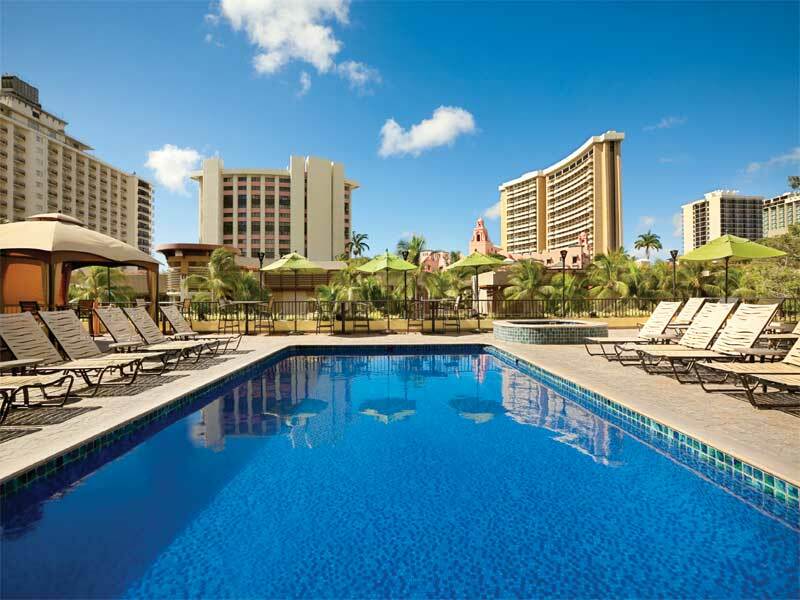 Waikiki Beachcomber by Outrigger is located on the island of Oahu in the heart of Waikiki. Enjoy easy access to all the major attractions of Waikiki—the resort is set on the city’s main street, Kalakaua Avenue, and is just 300 steps away from Waikiki Beach and next door to the International Marketplace! 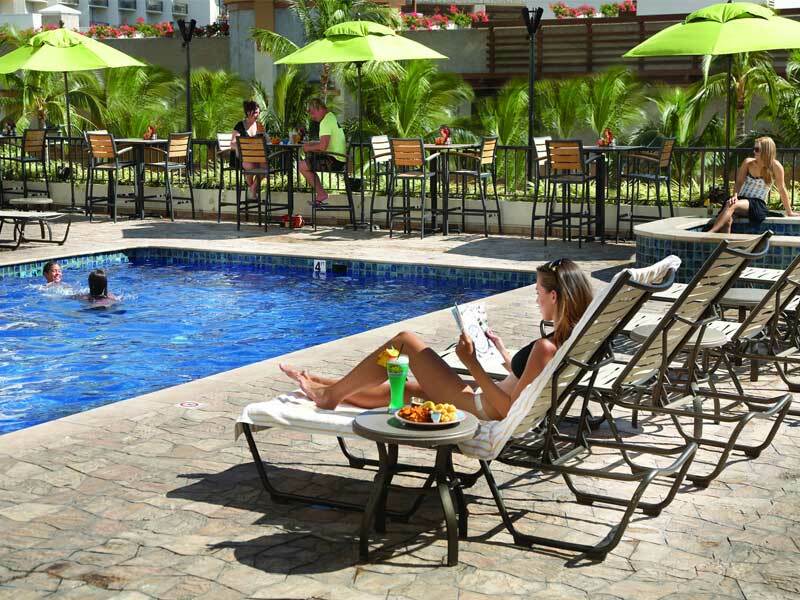 Get to the resort easily from the airport. Travel just 16km either via car or shuttle (additional charges may apply). There is plenty to do around the Waikiki Beachcomber by Outrigger. Surf, swim, snorkel or paddle in the Pacific Ocean waters or hike just over 3km to Diamond Head. Pass the Honolulu Zoo, the Hawaii Aquarium and a range of beautiful parklands on your way, or head the other direction to enjoy a range of shops. The exceptional International Marketplace is just next door to the resort, Ala Moana Centre is just over 3km away and there a plenty of boutiques, café and restaurants to enjoy in between. Enjoy the nightlife of the surrounding Waikiki city, stay onsite to witness the thrilling Magic of Polynesia show and plan day trips to Honolulu’s maritime memorials and the island’s North Shore! Great hotel in the centre of it all! What’s not to like? Across the street from the Cheesecake Factory and the staff were very helpful. Our room had a great view. Very convenient—close to beach, shopping and restaurants!